Keep Strength Training for a FUN 2nd Half of Your Life! Now, this is a fun weight bearing &amp; balance exercise! 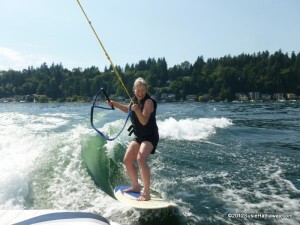 As a kid, I didn’t really expect at age 62 to be strength training to prevent osteoporosis OR doing a few of the FUN activities that came my way this summer. Learning to surf behind my brother’s boat tops the list! I had thought that those kind of days were behind me. But, when I managed to pull myself out of the water and stay on that board, I had such WONDERFUL feelings of elation and gratitude. Elation that I could still do such a kid-like thing and gratitude that I had the strength and balance to do it. I kept thinking how all of that strength training through the years was WORTH IT to be sliding down that wake with Mt. Rainier in the distance and feeling like a kid again. "Youth, Part 2" is my name for it! It’s funny what brings on feelings of youth. That first attempt of getting up on the surfboard, the subsequent fall with water up the nose brought back a great feeling of, “Oh, yea! Summertime!” My patient brother bringing the boat round and round for me. And the cool thing was, my 26 year old son learned that day, too. It was a good day! The difference between Youth, Part 1 and 2? I had some sore muscles and my son didn’t! Yes, we'll need to make a few adjustments and adaptations if we're going to play like this in this second half of our lives, but wow, it’s so worth it! Quality of life! Hang ten…or just hang on, surfer girls! Keep doing your strength training and weight bearing cardio because we still have a lot more fun in store for us! Send me a picture of your “Youth, Part 2” experiences! Thanks, Jeanette! I’m still smiling from that day! Susie…That is absolutely fabulous news! And what fun that would have been! So envious!! 62 and out skiing with your 26 year old! Does not get any better than that! Love it! Thanks for your classes so I too can be doing all that I am doing with ease and balance! My pleasure, Moni! And you do a lot! It always amazes me that even though you’re a avid gardener, you still come to class to get stronger. That sounds like terrific fun. What a great experience to share with your son! Hope he was suitably impressed. I wish I could report that my summer has been fun-filled. A bad landing on a rebounder resulted in a torn cartilage in my knee. However, I must say that the handful of physical therapists and docs who examined me all remarked on how exceptionally strong my legs were for a woman in her sixties. Thanks to you, I expect to keep active for another 20 years — but I think I’ll stay off rebounders! Bummer on the torn cartilage, but that’s nice about the medical people who remarked on your strong legs! Don’t you love it when someone notices the results of all of your training and can see that being strong over 50 is quite possible?? Way to go, Katie! You Rock and walk your talk ! Susie gets younger and younger by the year !! I know I’m her neighbor !! Way to go Susie. You inspire me. You really are never too old to do goofy things! Nope! What surprised me is that I didn’t have any fear about trying it this year. I’d been scared to try surfing for years! Getting up looked impossible to me. I figured, what did I have to lose?? At 10 mph, it’s not a very dangerous sport and wow, was it FUN! 6 Tips for Getting Holiday Exercise Done! 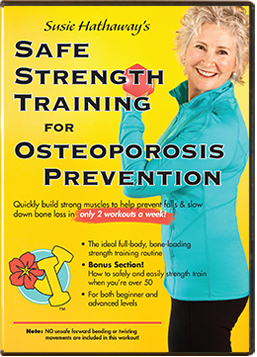 Osteoporosis Strength Training DVD Black Friday Sale! 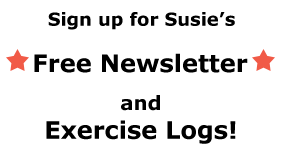 “When to Get a DXA and How to Interpret the Results” Free NOF Webinar! 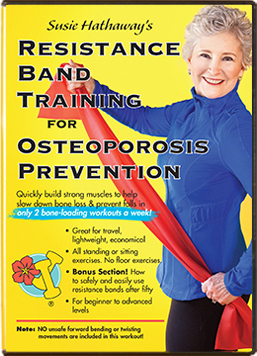 Osteoporosis Diagnosis & Lifetime Exerciser?